It appears that California water suppliers have by and large abandoned mandatory water conservation -- and it may be showing up in the latest monthly statistics on water saving in the state. 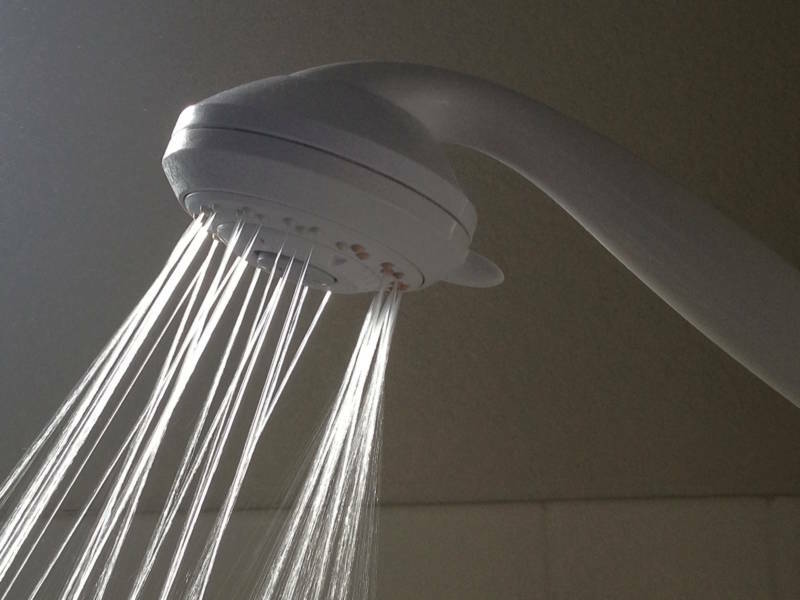 According to the State Water Resources Control Board, urban customers reduced water use by 21.5 percent in June, compared to the benchmark year of 2013. That's down from 27.5 percent savings a year ago, when statewide mandatory controls were in place. Savings were down even more compared to May of this year. After months of state-imposed compulsory conservation levels, local water agencies are now setting their own marks -- and setting the bar extremely low. 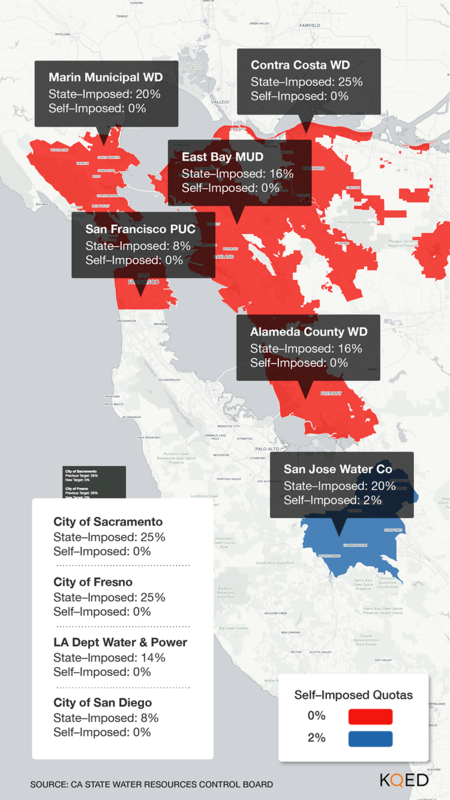 While state regulators continue to review the numbers reported to them by local agencies, KQED has surveyed major water suppliers in the Bay Area and Sacramento region and most of them have set their compulsory savings targets at (drum roll, please)...zero. Northern California's largest urban supplier, the East Bay Municipal Utility District, had been required to cut water use 16 percent compared to the benchmark year of 2013. Its new self-determined target: zero. The Contra Costa Water District likewise moved its goal posts from 25 percent to zero. The same goes for the City of Sacramento. 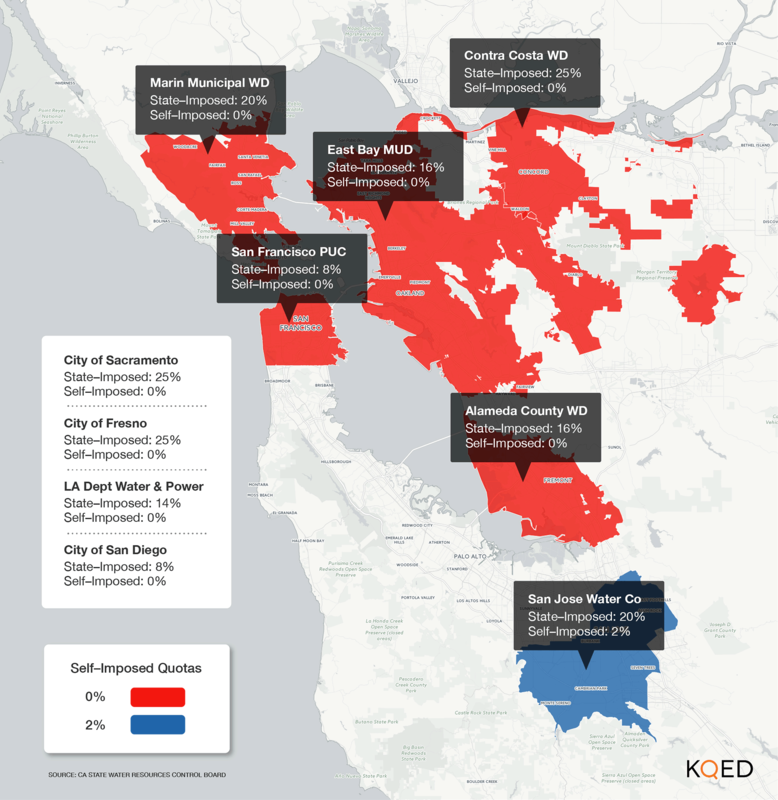 The Marin Municipal Water District ratcheted back from 20 to zero, Alameda County from 16 to zero, and well, you get the idea. Even in Southern California, where severe drought conditions persist, the story is largely the same. The state's biggest retailer of urban water, the Los Angeles Dept. of Water and Power had been operating under a 14 percent conservation order. Its new tier: zero. So far, state regulators have stopped short of saying publicly that this isn't what they had in mind when they decided to stop assigning water savings "tiers" and allow local officials to come up with their own numbers -- especially since state water managers continue to emphasize that the drought is not over, and may well worsen in the months to come. "Some relaxation of conservation in light of the relief we got last winter and other supply conditions is appropriate and expected," said water board chair Felicia Marcus in a statement. "Abandonment of conservation is not." Water managers have long argued that they are in a better position than Sacramento to know the level of water cutbacks that local conditions demand. And state regulators largely agree, which is why they've handed control back to the locals. The State Water Board prescribed the formula used to calculate the local quotas. Agencies were to assume that the next three years resembled the last three in terms of drought and water demand. Any shortage (in percentage terms) at the end of those three imaginary years was to become the new local conservation mark. Water Board officials have taken pains to point out that they will closely monitor the new system and that if it does not work to their satisfaction, they are prepared to return to a system of state-assigned quotas. Many local water managers say they remain committed to conservation with voluntary measures. Jennifer Burke, deputy director of water and engineering resources with the City of Santa Rosa, tells KQED that the city is "committed to water conservation and will continue to offer our many programs, tips and tools as well as continuing to implement water waste prohibitions," an apparent reference to the handful of water restrictions made permanent by the governor earlier this year. But Santa Rosa has also reset its compulsory conservation mark to zero. The state-imposed "tiers," as they were called, never went down well with local water suppliers, as selling less water meant a direct hit to their revenues. It's estimated that over the past year, local water agencies collectively lost hundreds of millions of dollars under the state-imposed cutbacks. Those suppliers might have to rethink their revenue models given the long-term trends. A recent analysis by the nonpartisan Public Policy Institute of California shows that overall water use is declining even as the state's population grows.